In my last blog, I wrote about designing and commissioning wireless lighting controls systems. I will build upon the topics addressed previously for this blog, in which I will review dynamic lighting system types, the kinds of projects best suited for their application, and best practices for their design, installation, and commissioning. The content for this blog was curated from the Lighting Controls Association’s Introduction to Lighting Controls, the U.S. Department of Energy’s pages on LED Color-Tunable Products, a May 2018 webinar produced by the Illuminating Engineering Society (IES) titled “Tunable White Controls”, and a few blogs that are linked in the sections below. Dynamic light can refer to a few different types of control options; the three major types are: warm dimming, color-tunable, and color changing control. Warm dimming control builds upon basic dimming capability by adjusting light fixture color temperature (CCT) along with light level (see Figure 1 below). This type of control is intended to mimic incandescent fixtures or candlelight. As fixture light levels are lowered, CCT will decrease (light output is warmer; commonly as low as 1800K), and as fixture light levels are raised, CCT will increase (light output is cooler; commonly as high as 3000K). This type of control is well-suited for restaurants, hospitality, entertainment, and some residential spaces. Color-tunable or ‘tunable white’ control allows users to create preset ‘scenes’ for diverse scenarios. 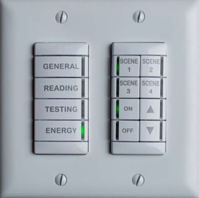 For example, a classroom wall switch might be set up like Figure 2 below, with different light level and CCT settings suited for those activities. An interior patient room at a hospital might have a ‘morning’, ‘lunchtime’, and ‘bedtime’ scenes to mimic natural daylight. Color-tunable control provides more flexibility than warm dimming and in addition to mimicking daylight for circadian rhythm or assisting with behavior control, can also provide different ambience and enhanced environmental control for a variety of situations. This type of control is well-suited for healthcare, educational, office, and multifamily spaces. Color changing control incorporates saturated colors to affect mood or appearance of a space (see Figure 3 below for an example). Another example might be accent lighting at a stadium gift shop that can be adjusted to represent a team’s colors. This type of control is well-suited for restaurants, entertainment, healthcare and office spaces. Do I want to mimic incandescent light or candlelight in the space? Do I want to mimic daylight in the space? Do I want to assist with behavior control or support the human circadian system? Do we want to use light to provide whimsy or mood enhancement? Do we want to use light to create ambience, accomplish biophilia, or tie in branding? Are there products or other items that need lighting to be tailored for their display? If the answers to at least one of these questions is “yes”, a dynamic lighting system might be an option to consider for the space. Defining use cases and key stakeholders is crucial for designing effective dynamic lighting systems. During architectural programming define tasks and experiences that require custom considerations for each space. Consider both typical user ‘personas’ as well as special individual users and visualize their potential interactions with the lighting control system. Think about how the system might transition between use cases and different user groups. An Owner’s Project Requirements (OPR) document can be a very valuable tool for design development, as it ensures that stakeholder input is captured and incorporated into lighting layouts and sequences of control. After key stakeholders are identified, invite user groups to review draft designs to confirm that requirements of the OPR are met. Consider installing mockups so that users can give feedback based on their own hands-on experience. An engineer specifying a dynamic system is working with a market that is still catching up to older concepts like wireless lighting controls. Product cut sheets are not all created equal, and details may be vague, or missing. LED lighting product manufacturers provide varying color temperature ranges, dimming methods, and feedback capabilities, and all these characteristics affect color consistency, accuracy, and quality. Review photometric tests to ensure that different fixture types at the same CCT setting look the same. Consider specifying fixtures with feedback loops so that the fixtures can maintain color temperature appearance as LEDs age. To minimize flicker, consult the NEMA 77 Flicker Recommendations and select fixtures with Pst values <0.7 and SVM values < 1.6. When modeling dynamic lighting systems, be aware that circadian light metrics will be different at eye level compared to luminaire level. Account for this difference by assuming an intensity <100% in light models. For more information on specifying and modeling color-tunable fixtures, check out ‘Color-Tunable Caveats’ from the August 2016 edition of Lighting Design + Application (LD+A) magazine, published by the IES. IES subject matter experts recommend specifying digital control protocols for dynamic lighting systems. This type of control allows for more flexibility, including independent control of intensity and color temperature. Their configuration can also reduce setup time, eliminate challenges during construction and operation, and allow for greater flexibility down the road. Selection of light fixture and controls manufacturer may determine how control loops will must be set up and how many addresses are necessary for the sequence of control. Consider planning for the future and avoiding filling up all your control devices. It is critical that sequences of operation be customized for spaces and users. Sequences should be clearly outlined in contract drawings and lighting layouts should be easy to understand. For each room, floor plans should illustrate the control device locations and applicable control sequence for the space. With dynamic lighting systems, more control variables and use cases mean more complex sequences of control. Detailed lighting narratives are a helpful companion to sequences that can offer additional information for specific use cases and settings. For example, for a warm dimming or color-tunable system, a narrative should define CCT settings for various use cases, light level settings and/or time of day. Additional considerations could include fade duration, override time limit, and associated motorized shade settings. In healthcare projects where patients and caregivers could have separate access to lighting controls, patient control lockout should also be described for each use case. There are additional metrics to consider for color changing systems. Humans prefer saturated colors, so engineers designing color changing lighting systems can use tools to predict how colored light will appear in the field and evaluate the color rendering capabilities of selected fixtures to ensure optimal saturation. 50 years ago, the color rendering index (CRI) was developed, and it has been historically used for evaluating color fidelity. As solid-state lighting has become the norm, the International Commission on Illumination and IES developed the new TM-30-15 guideline for evaluating color fidelity across the color temperature range of fixtures. And engineer specifying color changing lighting controls should use the fidelity index, Rf, in place of CRI, as it provides a more accurate prediction of real-world performance using a larger database of samples than that used for the development of CRI. Additionally, saturation can be measured using the the gamut index, Rg. The U.S. Department of Energy has published a helpful fact sheet for guidance when using the TM-30-15 document. Commissioning agents functionally testing dynamic lighting systems should note that – like any other system – field performance will differ from the engineer’s model. During commissioning, verify metrics using third-party calibrated measurement devices like a light meter that can measure CCT, or a circadian monitoring device. Be aware that most rooms in residential and commercial buildings have warm tones, and décor can result in CCT swings of 1000K or more! 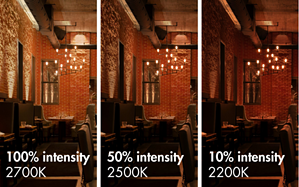 Using field measurements, tune intensity and color temperature settings to align with desired lighting quality. 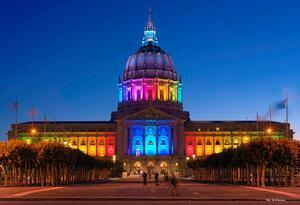 Have you ever designed or seen dynamic lighting systems in person? Did you encounter any challenges with designing, installing, or operating the system? Please share your stories below.